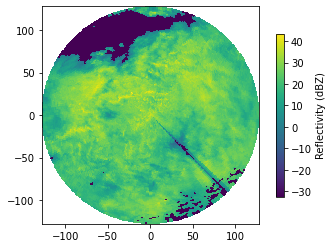 This tutorial helps you to read and plot the raw polar radar data provided by German Weather Service (DWD). 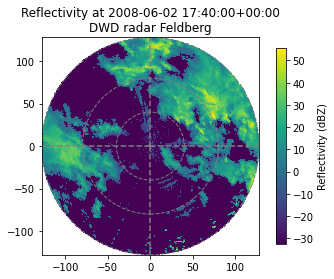 The German weather service provides polar radar data in the so called DX format. 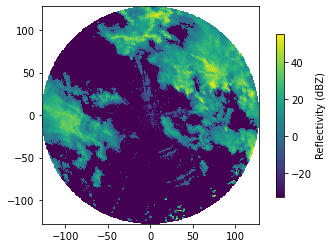 These have to be unpacked and transfered into an array of 360 (azimuthal resolution of 1 degree) by 128 (range resolution of 1 km). For example: raa00-dx_10908-200608281420-fbg---bin raw data from radar station Feldberg (fbg, 10908) from 2006-08-28 14:20:00. Each DX file also contains additional information like the elevation angle for each beam. Note, however, that the format is not “self-describing”. Suppose we want to read a radar-scan for a defined time step. You need to make sure that the data file is given with the correct path to the file. The read_dx function returns two variables: the reflectivity array, and a dictionary of metadata attributes. This is a stratiform event. Apparently, the radar system has already masked the foothills of the Alps as clutter. The spike in the south-western sector is caused by a broadcasting tower nearby the radar antenna. The radar data was kindly provided by the German Weather Service.